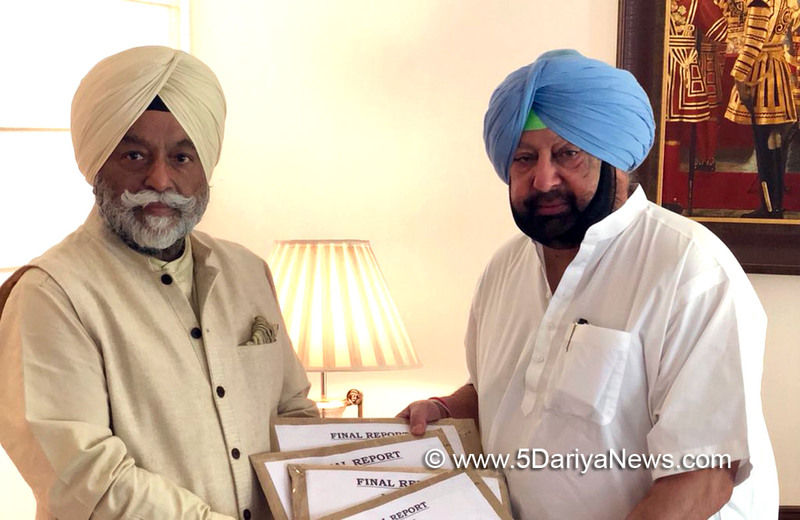 Punjab Chief Minister Captain Amarinder Singh has directed the state home department to take further necessary action on the full and final report on sacrilege cases, which was submitted to him today by Justice (Retd) Ranjit Singh.The Justice (Retd) Ranjit Singh Commission had earlier, on June 30, submitted Part-I of his report to the Chief Minister. That had dealt with the incidents of sacrilege at Village Burj Jawahar Singh Wala, Bargari, Gurusar and Mallke, as well as the firing incident of Behbal Kalan and Kotkapura.The final report is in three parts, according to an official spokesperson. Part-II deals with incidents of sacrilege in districts SAS Nagar, Fatehgarh Sahib, Rupnagar and Patiala, while Part-III is related to incidents in SBS Nagar (Nawanshahr) and Hoshiarpur. Part-IV relates to sacrilege incidents in districts Amritsar, Bathinda, Barnala, Faridkot, Fazilka, Ferozepur, Gurdaspur, Jalandhar, Kapurthala, Ludhiana, Mansa, Moga, Sangrur, Sri Muktsar Sahib and Tarn Taran.The complete set of reports, along with Action Taken Report (ATR), will be tabled in the next session of the Vidhan Sabha, as already announced by the Chief Minister. The Chief Minister has repeatedly asserted that those found guilty of trying to create religious disharmony in the state through such actions would be punished.The Commission was set up in April 2017 by the Captain Amarinder Singh led Congress government to investigate the various incidents of sacrilege of the holy Guru Granth Sahib and other religious texts. The Congress government had decided to constitute the panel after rejecting as 'inconclusive' the findings of the Zora Singh Commission, set up by the erstwhile SAD-BJP government.The terms of reference of the Commission were to conduct an enquiry into the cases of sacrilege of Sri Guru Granth Sahib Ji, Srimad Bhagwad Gita and Holy Quran Sharif, enquire into the detailed facts and circumstance and chronology of events of what actually happened and to identify as a matter of fact the role played by various persons into what happened, and also to enquire into the truth of what occurred in such incidents and factual role of the persons who may have been involved. The Commission was also mandated to enquire into the firing in Kotkapura on 14.10.2015 and village Behbal Kalan, district Faridkot, in which two persons died, besides identifying and enquiring into the role of the police officers/officials in incomplete/inconclusive investigations into the earlier incidents of sacrileges so far.Acting on the first report submitted by the Commission, the Punjab Police has included the names of four police personnel in the FIR registered in 2015 in the Behbal Kalan firing incident.In accordance with the recommendations of the Commission, and on the directives of the Chief Minister, the roles of five other police officers will also be thoroughly investigated.Regarding the Kotkapura firing, a case under Section 307/323/341/148/149 IPC & 27/54/59 Arms Act was registered on August 7, as per the Commission’s recommendation.